One of my favourite drinks is fruit juice. Sadly lots of fruit juices had added sugar or are high in sugar content themselves, meaning I rarely enjoy it. Cracker Drinks Co. have come up with a temptingly refreshing drink, perfect for serving at summer parties, or enjoyed as a quick thirst quencher for yourself- with no added sugar. The range is naturally lower in calories, averaging around 30% less calories per 100ml than 100% orange juice or added sugar juice drinks. It’s also a great option for the little ones as it remains high in fruit content to offer the added benefit of 1 of your 5 a day. The range is completely natural and free from any artificial sweeteners, with just Stevia to add a little extra sweetness. It comes in 4 delicious flavours, Mango & Passionfruit, Pineapple, Coconut & Lime, Still & Cloudy Lemonade, Apple, Raspberry & Sloe. All flavours are delicious, and not as watery as I imagined they would be! 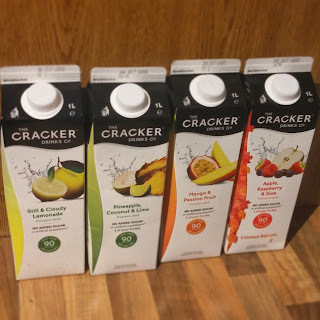 In conjunction with The Cracker Drinks Co the UK’s leading masters of mixology have crafted the perfect naughty but nice summer cocktail range that are low in sugar, low in calories but still bursting with flavour, ideal for summer BBQ’s, long lazy summer afternoons and garden parties. Here’s a guide for swapping your usual sugary summer sips for a Calorie Cracking Cocktail. Fill a glass with cubed ice then add all the ingredients, stir briefly then cap with crushed. Muddle the herbs in a cocktail shaker then add all other ingredients. Shake hard over ice and strain into chilled Champagne Saucer or Martini glass.